SPRINGFIELD, Ore. (AP) — Jackie Campbell, 23, her three children, boyfriend and two small dogs have been living out of their Ford Explorer for about four months. The family had been moving from place to place in the Explorer, but they settled more recently in the parking lot of the Walmart Supercenter on Olympic Street in Springfield. 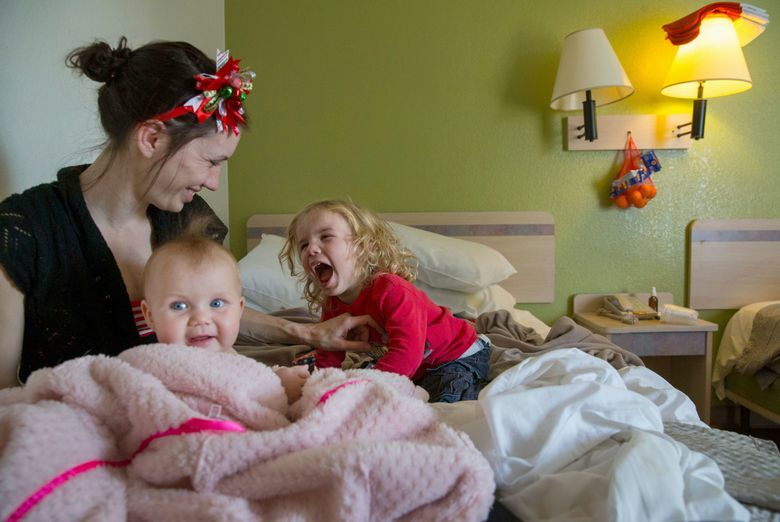 But when nighttime temperatures in the Eugene-Springfield area dropped below freezing, Campbell realized that she couldn’t risk sleeping in her car with 7-month-old AnnieMae, 2-year-old Kingsley and 6-year-old Cannon in such cold weather, despite the layers of blankets and clothing the family had collected. Campbell said that when the freezing temperatures started, she contacted First Place Family Center, which put her in touch with Catholic Community Services, an assistance agency in Eugene and Springfield. Among other services, Catholic Community Services, or CCS, funds a motel voucher program that aims to give homeless families a warm place to sleep on cold nights by paying for their motel rooms. CCS activates its motel voucher program when the Egan Warming Centers open their doors to the public, which happens when temperatures are at or below 30 degrees between Nov. 15 and March 31, so that homeless people in Lane County have a warm place to sleep. But families with children are not allowed to stay overnight at Egan Warming Centers, for their own safety, because the centers have open sleeping accommodations that host hundreds of homeless adults. That’s where CCS comes in. The economy motel rooms funded by CCS are reserved only for parents with children. Even before winter officially has begun, the charity is running out of money to use on the motel voucher program because of an unusually long cold snap this month. Since Dec. 4, overnight temperatures in the Eugene area have hovered around 30 degrees, reaching into the low 20s some nights. Wednesday was the 10th night in a row that the area saw overnight temperatures at or below 30, and CCS booked motel rooms for families every night. Tom Mulhern, executive director at CCS, said the motel voucher program has never seen such a large influx of families in need of a warm place to sleep. Mulhern said that a lack of affordable housing in the area is at the root of the problem, but that issue likely won’t be solved anytime soon. Mulhern said he received a call Tuesday from a woman and her family who were asking for an extension on their motel stay. Each motel room costs an average of $63, according to Mulhern, who said the charity already had booked 32 more rooms as of 10 a.m. Wednesday. In the past two weeks, CCS has paid for 224 hotel rooms. By comparison, the charity paid for 235 rooms during the course of the entire winter last year. 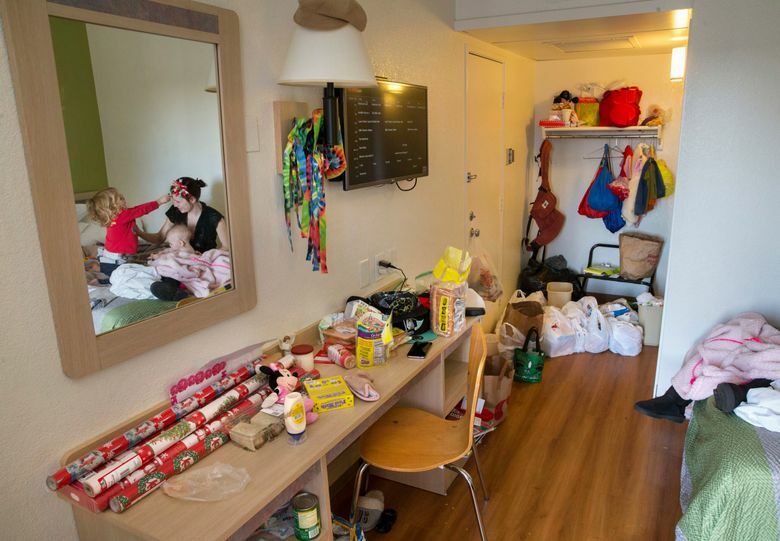 The CCS motel shelter program started the season with $7,000 from Lane County Human Services and $8,000 from private charitable donors, according to Mulhern. Nearly all of that already has been spent on motel rooms in the past two weeks or so. In order to provide services through the rest of the winter, Catholic Community Services is asking for additional funding from Lane County as well as from the community. Mulhern said Lane County likely will allocate some additional funding to the program within the week, but that other programs in neighboring towns also need some help. Campbell and her family, who recently were approved for rental of an apartment in west Eugene, just have to make it through the next few days before they get to move into the complex on Tuesday. Campbell said Catholic Community Services really did provide that “stopgap” fix for her family.